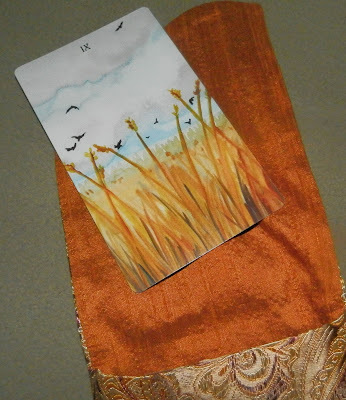 Weekend Reading: Nine of Crows from the Badger's Forest Tarot by Nakisha (on top of its tarot bag from WyldeChilde). Hey, take it easy this weekend. If you read yesterday's post, then you know that you need both work AND play in your life. So this is the time for play. Relaxation. Enjoyment. Rest. This picture reminds me of a bird sanctuary/marsh I like to go to. It's quiet and peaceful and far from the madding crowd. Get thee there this weekend...to your special place. And just inhale the beautiful, non-stressed, non-errand-running breath of nature.